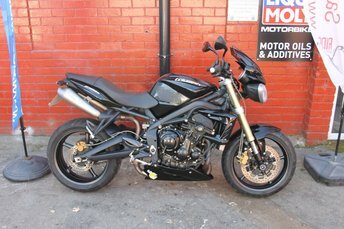 Used Triumph Street Triple bikes in Bradford from Ride Motorbikes Ltd.
Offering a range of engines and specifications, Triumph's Street Triple line-up has something to suit every rider and style. Discover all about the Street Triple S, R and RS models by speaking to a member of the team at Ride Motorbikes Ltd. today. Our experienced staff will be able to supply advice and guidance, and will always go the extra mile to ensure you find the right pre-owned bike to suit your requirements. You'll find all of our current used Triumph Street Triple motorbikes listed here on the website, and don't hesitate to contact the showroom with any questions and to arrange a test ride. Rest assured that all of our second-hand motorcycles are put through a rigorous testing process before going on sale.